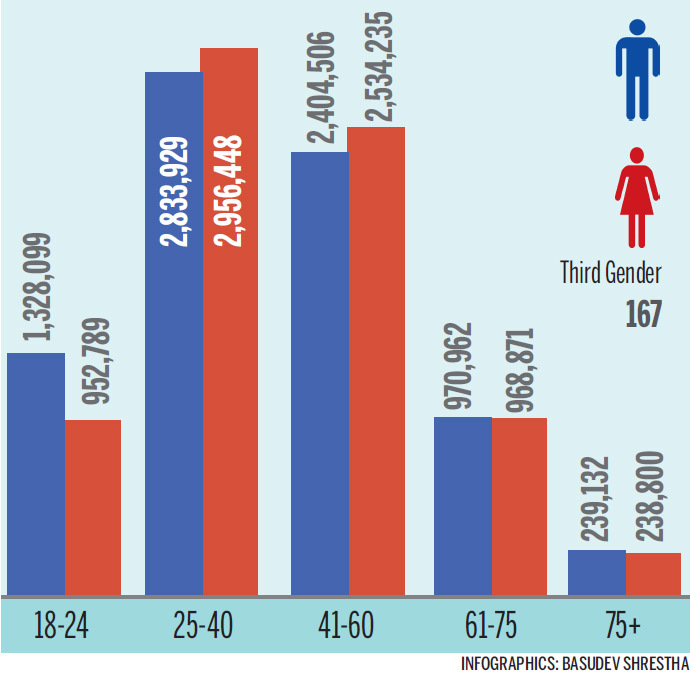 More than half of the registered voters for the upcoming federal and provincial elections are in the 18-40 age group, according to the final voter list of the Election Commission (EC). However, experts doubt the young voice will be fully heard when the country votes on November 26 and December 7, largely due to outmigration of the country’s youth in search of job and other opportunities. According to the EC, there are a total of 8,071,369 voters aged between 18 and 40, which is 52 percent of total registered voters. Within that group, the largest number of voters are in the 25-40 age group. There are a total of 15,427,938 eligible voters for the upcoming elections after 1,355,519 voters were added after the local elections. While a huge chunk of youth population is in various labour destinations like India, Malaysia and Gulf nations, many youths are in urban centres or in areas other than their hometown for studies, employment or other reasons, which could mean they might not be able to vote. The government does not have the exact number of Nepalis residing abroad and those who have migrated within the country. More than 3.8 million permits for working abroad (excluding India) were issued by the government between 1993-94 and 2014-15, which represents almost 14 per cent of the current population, according to a report titled “Labour Migration for Employment: Status Report of Nepal 2014-15” prepared by the Ministry of Labour and Employment. Even all those who have migrated to urban centres may not reach polling centres due to various reasons like jobs, studies and other compulsions, according to the experts. Former election commissioner Dolakh Bahadur Gurung said considering the possibility of under-representation of the young people, appropriate measures need to be explored to ensure that they can vote. “The possibility of using technology such as mobile and internet for voting must be explored,” he said. There is, however, also the possibility that voters of the 18-40 group may give a surprise result. According to anthropologists, voting pattern of young people is different from that of older people.